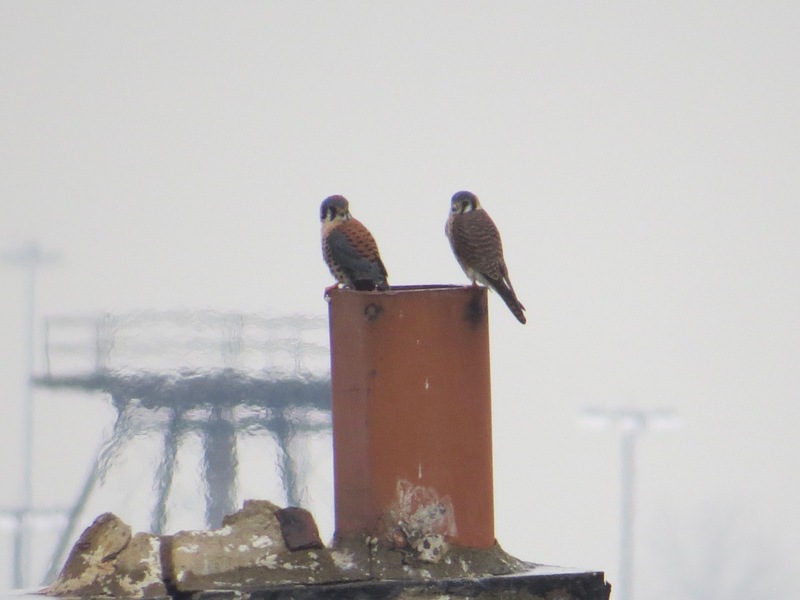 A pair of American Kestrels has been cavorting around, all visible from our windows. 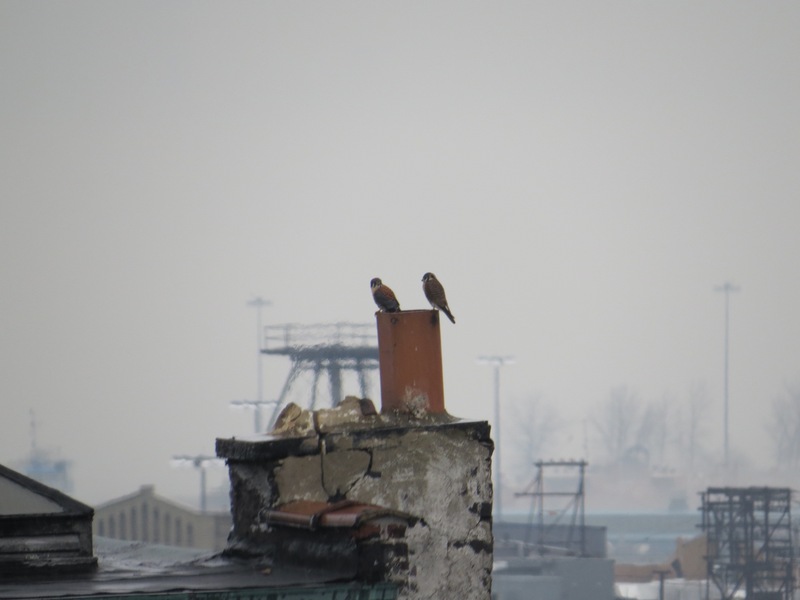 Here they’re perching on a chimney pot (you may recognize it from previous Kestrel and Cooper’s Hawk perching). Male left, female right. I saw a pair — this one or another? — mating in January. March-April is more like it, with May the usual time for nesting. But this early mating, and calling together, and sky dancing, etc., is all good solid pair-bonding work. We saw the male fly into this cornice hole, the perfect urban Kestrel nesting spot. It’s just a short block away, but not visible from our windows! But that was a one-time sighting. Perhaps he was scouting. The local Starlings — whose guano I assume that is — were not amused. 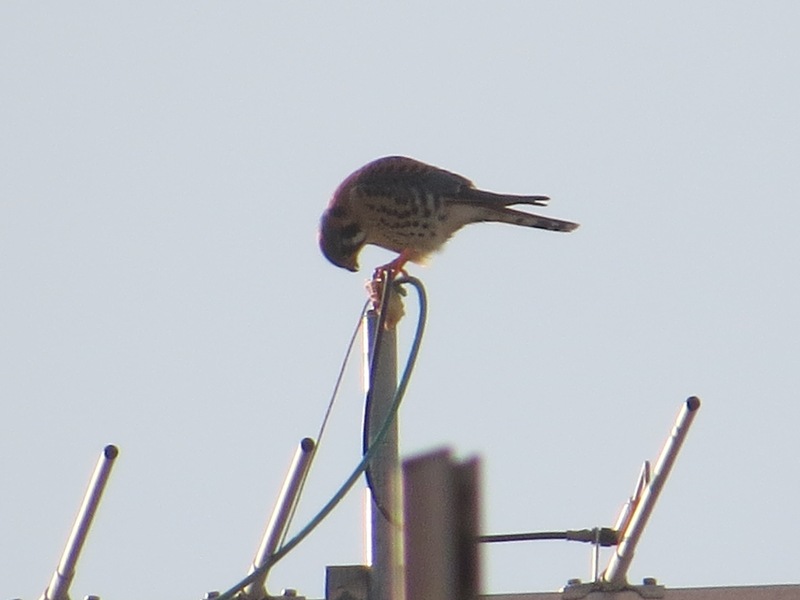 American Kestrels, like other raptors, cache food. They do it in winter, when hunting is lean, and during the breeding season, when extra food is most welcome for the female and the young. In one study (in The Condor Vol. 79, No. 1. Spring, 1977. pp. 63-68) done during California winters, the cached prey included shrews, mice, voles, snakes, lizards, and frogs. Kestrels seem most successful in perch hunting — making a sorte from a perch — with a 54% success rate compared to 23% in hovering. This hunting study, quoted in Weidensaul’s Raptor Almanac, also found that insects are easier to catch (85% success rate) than vertebrates (23% success rate). As with other birds of prey, the more mature birds have better success hunting then the younger. They’ve learned the hard way. As with all raptors, those who survive their first year — one study had a 68.8% mortality rate for juvenile Kestrels — have a much better chance of living longer. But, small bird problem: this still isn’t a very long time. Average lifespan is a year; only 15 out of 500 in this study made it to four years. The oldest banded American Kestrel was 11.07 years. The oldest recorded American Kestrel in captivity was 17 years old. This male is eating something that sure doesn’t look like anything I listed above, does it? Do they scavenge? 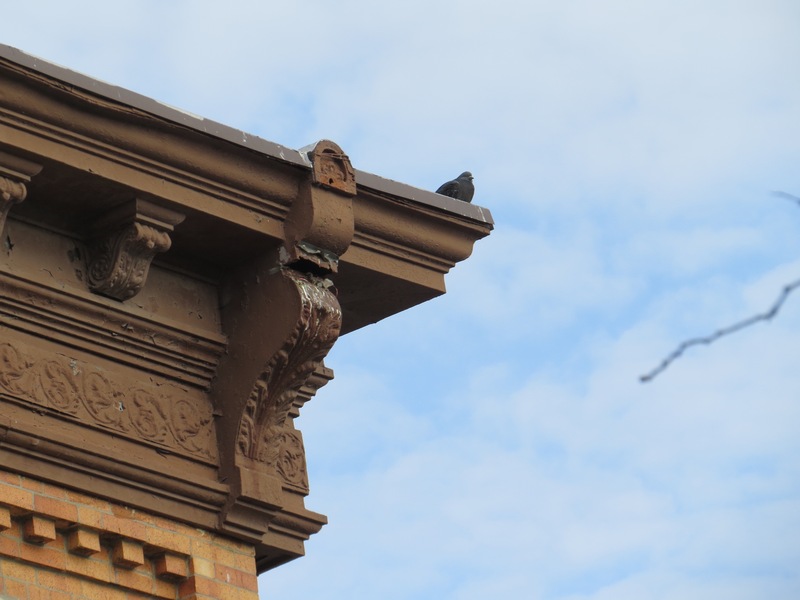 There isn’t much literature on these birds in urban habitats, but why not scavenge? Sure hope it isn’t a “chicken” nugget, though. Lovely!! we know whats to come in a few months. Great shots of them doing what they do. Thank you for posting about the Kestrels!! I live in a semi-rural area Baltimore County, Maryland and am trying to attract kestrels to my property to aid in keeping larger birds of prey away from my free ranging chickens. I have built a nesting box and am in the process of trying to mount it at a proper height. Supposedly they are fiercely territorial up to about 1 mile of their nest, hopefully keeping the other larger birds away. Good luck! I’ve seen definitely seen them chasing larger birds. Note that other birds might try to use your kestrel box and you might have to evict them.